Massimo Bottura recently announced plans to open a refettorio, a restaurant where chefs use rescued food to create meals for vulnerable locals, in collaboration with OzHarvest CEO and founder Ronni Kahn. Bottura opened his first “community kitchen” in an abandoned theatre on the outskirts of Milan in 2015. In 2016, he and his wife Lara Gilmore founded Food for Soul, a not-for-profit organisation which aims to “empower communities to fight food waste through social inclusion”. Since then the refettorio has “become a global movement”, according to Bottura, with kitchens opened in Rio de Janeiro, London, Paris and Naples. In Australia, more than five million tonnes of food ends up in landfill, costing an estimated $20 billion a year. OzHarvest collects over 180 tonnes of food each week from food donors across Australia, including supermarkets, restaurants and catering companies. 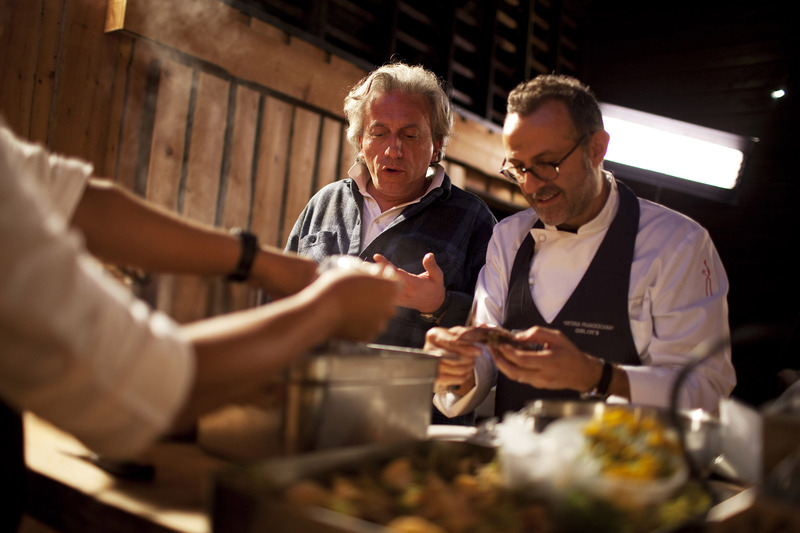 Bottura met Kahn in 2016, an experience he has since described as “like meeting a kindred spirit that I had known all my life”. “We share the same passion, values and vision to create a better world, and are both determined to make a difference,” he said. The pair are hoping to open the refettorio this year, with the assistance of some of Australia’s top chefs. “I’m currently looking at locations in Sydney, so if anyone has a space to offer, give me a call,” she added. The community restaurant would be run by chefs and volunteers, with OzHarvest looking after the site, operations, volunteers and supply of rescued food. Bottura’s three-Michelin-star restaurant Osteria Francescana, located in Modena, Emilia-Romagna, was voted the world’s best restaurant in 2018. Bottura is famous for telling the stories of his childhood and life through his innovative cooking, which resembles abstract expressionist paintings on the plate. His culinary creations are rooted in the traditions of Modena, an ancient city of narrow streets and grand piazzas where they’ve been making parmesan cheese and balsamic vinegar the same way for centuries. Some of Bottura’s more famous and zany dishes include “Oops! I dropped the lemon tart” and “The crunchy part of the lasagne”. Bottura and Gilmore are currently set to open Casa Maria Luigia, an intimate guesthouse in the Emilian countryside on an 18th-century property which aims to “extend the art of hospitality beyond the doors of Osteria Francescana”. Massimo Bottura will return to Australia in August for a series of stage shows in Perth, Sydney, Melbourne and Brisbane. He has been described as “poet, storyteller and artist as much as a cook”.